A reader asks: I travel often for business, and my 5-year-old laptop is showing signs of age. What are some of the differences that make so-called ‘business laptops’ worth the extra money, and what laptop brands or models do you recommend for business users? What is The Best Laptop For Business Users? Every laptop manufacturer has several models that it touts as “business” laptops. Generally, business laptops tend to be more expensive than so-called consumer-level laptops. But they also have several distinguishing features that justify the higher price tag. Touchscreens are all the rage today and touchpads have been standard pointing devices for years. But business users need the precision of a mouse or joystick, the smaller the better. Optional HD touch-sensitive displays are available for business laptops that feature Windows 8 or later. Enhanced support is another feature of many laptops sold for business use. When your business laptop goes down, you can call a special toll-free number to get it fixed or replaced ASAP. The extra support contributes to the higher cost of business laptops, but the cost of being down without access to your files can far outweigh the price of timely repair service. Business laptops often have to connect to a wide variety of devices found in clients’ offices, convention centers, and other locations. So business laptops come with USB ports, Firewire, eSATA, and a variety of other connectors. WiFi is standard on every computer now, but a WiFi network may not be available in every business setting. So in addition to a built-in WiFi adapter, many laptops offer integrated cellular modems as an option, enabling fully mobile communication wherever a 3G of 4G cellular signal can be had. Hard drives of 250 GB or greater capacity are standard in business laptops. Solid-state drives (SSDs) are appearing in business laptops, and their lack of moving parts make them more shock resistant than traditional hard drives. Dual core CPUs are standard in business laptops. The Intel Core series processors (i3, i5 and i7) are the most popular, but the lower-cost AMD Athlon II or Turion II processors are less expensive and have loyal followings. Some business laptops use low-voltage versions of CPUs to extend battery life. Standard voltage versions of the same CPUs are faster. A business laptop should have 4 GB of RAM. More is overkill unless the machine is used for processing large databases or high-resolution graphics or video. Less RAM will slow you down, especially if you rely on an integrated graphics processor (which shares RAM with your operating system) or keep multiple applications open at once. 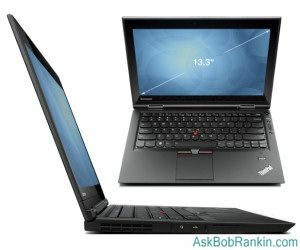 Lenovo Thinkpad T400s: legendary for its high-quality build, this 15-inch display Thinkpad is also an excellent all-around performer; this model comes with a SSD and backlit keyboard. Lenovo Thinkpad X240: the ultimate ultraportable with a 12.5-inch screen and record-breaking 20.5 hour battery life on a 6-cell battery. Even the lighter 3-cell battery provides more than 8 hours of runtime. HP Elitebook 850 G1: for businesses that prefer Windows 7, it will be hard to beat the cost/benefit ratio of this machine. HP’s SureStart software detects malware upon booting, and Trust Circle encrypts files so that only trust users can access them. The 4.4 pound weight and 7.5 hour battery life are appealing. Dell Latitude E6540: a tri-metal chassis can take extreme handling and temperatures. The 15-inch HD screen does not preclude 7+ hours of battery life. Dell’s ControlVault and Protected Workplace software keep data secure. Acer TravelMate P365: a sleek Ultrabook design featuring password and fingerprint scanner authentication, plus file encryption to keep data secure. A zippy Core i7 processor and 256 GB of SSD make it blazing fast, and the 10-hour battery life is ample for most business days. Lenovo Thinkpad Yoga: its display bends into presentation, tablet, or tent mode. This 3.5-pound hybrid also sports a full HD touchscreen and 8-hour battery life. HP ZBook 14: a 3.6-pound speedster with a Core i7 CPU, 250 GB of SSD, and AMD FirePro M4100 graphics. The sturdy backlit keyboard and 14-inch HD display make this an all-around winner. Dell Precision M3800: the lightest 15-inch business workstation features a powerful Core i7 CPU, Nvidia Quadro GPU and a quad HD Gorilla Glass display with 3200 x 1800 pixels. It also sports some of the fastest SSD on the market, an aluminum lid and carbon fiber chassis. At work I had used a 15.6 inch Hp Pavillion XP. I had kept notes on about 10-15 jobs a day I retired 5 years ago and bought an Acer N270 11 inch XP. The acer was a nice upgrade becausse of the size, I could fit it in between the steering wheel and me. I’ve kept notes on the Acer on all my travels for the last 5 years. I also like the small size for taxi and in flight notes and observations. I’m ready for an upgrade to W7 or 8. I like the newer units battery life, keeps a person from carrying extra batterys. and yes I’ll stay with the small size. I’m used to it now and wouldn’t go any bigger. Well anybody will tell you that HP is cheap and raeilble but I tell you something I have also got many HP complaints. If you don’t want a gaming machine and want a Laptop which will work and that too Hassle Free then please go for a Lenovo. There is a very good Model of HP too cheap and good HP nx6125 but if you can go for the Lenovo Z60. It is simply Awesome.